Aquatic Arts 1 X-Large Piece of Tiger Wood Natural Aquarium Driftwood, 14-18"
Driftwood is an essential component for decorating a naturalistic aquarium. Tiger Wood Driftwood is an excellent choice for aquascaping. This type of driftwood is highly variable, but it always has a very complex appearance. While many retailers sell artificial pieces of simulated driftwood, our pieces are REAL Tiger Wood! We are pleased to be able to offer pieces of all sizes to fit the smallest to largest aquariums. 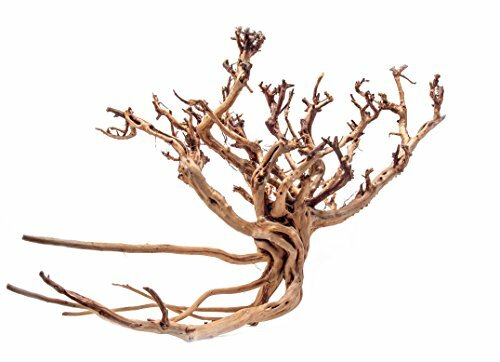 In addition to providing dramatic, natural scenery in the aquarium, driftwood plays in an important role in the wellbeing of any aquatic environment. It provides shelter for aquarium animals and it can serve as an anchor for plants such as Java Fern, Anubias, and Java Moss or other mosses. Each Tiger Wood Driftwood piece is unique and will make an attractive addition to any freshwater aquarium! All of our aquarium driftwoods and rocks are treated for aquarium use after simple rinsing. Some driftwoods can initially release tannins in the water, although Tiger Wood is among the least likely to do this and it will not discolor aquarium water. Tannins are not necessarily harmful to aquarium plants and animals, but they will lower the pH of aquarium water. To reduce the release of tannins, simply boil the driftwood for a few minutes (or longer for larger pieces). If desired, driftwood can be boiled repeatedly until the boiling water does not tan at all in order to completely remove tannins before aquarium use. Otherwise, this driftwood will stop releasing tannins over time with regular aquarium water changes and maintenance. Tiger Wood is relatively dense and will sink within a few days or less. View More In Habitat Décor. If you have any questions about this product by Aquatic Arts, contact us by completing and submitting the form below. If you are looking for a specif part number, please include it with your message. Aquatic Arts 1 Large Piece of Malaysian Natural Aquarium Driftwood, 12-14"
Aquatic Arts 1 Large Piece of Spider Wood aka Azalea Natural Aquarium Driftwood, 14-16"